He also compared Peyronie's disease with Dupuytren's disease, a condition where one or several fingers become permanently bent into a flexed position. His areas of expertise includes surgery for nerve compressions such as carpal or cubital tunnel, Dupuytren's disease, tendon problems, osteoarthritis and rheumatoid arthritis, as well as hand, wrist and finger injuries. Another safe pair of hands! 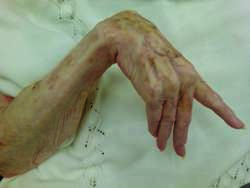 The condition is linked to two others - Dupuytren's disease and Ledderhose disease. They describe surgical exposures, techniques, and infections; fractures and dislocations; tendon pathologies and surgery; surgery for nerve disorders and deficits; surgery for arthritis; Dupuytren's disease, neoplasms, amputation, and vascular surgery; and hand surgery for trauma and congenital differences in children. This study depicted a picture similar to Dupuytren's disease. Dupuytren's disease on the radial aspect of the hand: report on 135 hands in Japanese patients. Eighteen years follow-up study of the clinical manifestations and progression of Dupuytren's disease. Dupuytren's disease is a progressive condition affecting the hand, specifically the layer of tissue just under the skin of the palm and fingers. Gender ratio of Dupuytren's disease in the modern U. Prior surgery for Dupuytren's disease did not affect attainment of the primary end point. These complications include compartment syndrome, complex and regional pain syndrome, Dupuytren's disease, nerve injury, tendon and ligament injuries, nonunion, and malunion.